I want to catch myself saying, “Yes,” more often. I’ve decided to embrace a new motto in my life: “Yes, and…” These words come from a technique used in improvisational theater. The idea is that in order to keep energy flowing, the ideas coming, and to collaborate well with others in an improvised scene, we agree to affirm whatever is given to us and then suggest something else. If we’re onstage and you say, “ I see you have a turkey on your head.” And I say, “No, I don’t,” then we might find ourselves wondering what to do next. The scene dies. However, if I say, “Why yes, her name is Gladys and she’s just about to lay an egg. Let me put her down,” I’ve created many more options for where we can go next. When we say, “No,” it is harder to create connection, harder to access our own creativity. I think this practice makes sense in this time of swift change that requires a great deal of creativity, improvisation, and connection to others to find the solutions we need. “Yes, and … ” ? Do you see a need for more justice? More sustainable living? More beauty? More joy? There are lots of options. The only choice that I hope you won’t make is to take yourself out of the scene altogether. All ideas are needed. The New Moon on March 22 occurs just a couple of days after the Vernal Equinox in the Northern Hemisphere. The beginning of each season is a gateway. We get to make choices about how we pass through. These choices occur in an energy field described by the planets. 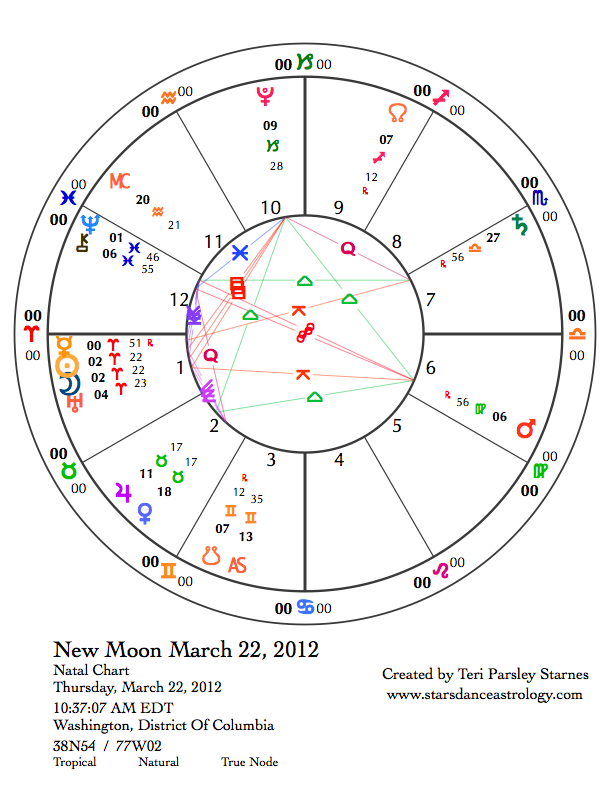 It is significant that spring begins so close to a new moon. It enhances the feeling that we are about to embark on something very new. Anticipation is high. Added, also, is a bit more anxiety about what these changes will be or how we can best be part of them. Researchers have shown that we are more creative after hearing a good joke. Maybe that is why April Fool’s Day happens in the spring when so many new projects begin. Undoubtedly, a sense of humor can help us stay responsive and able to solve any problems ahead. 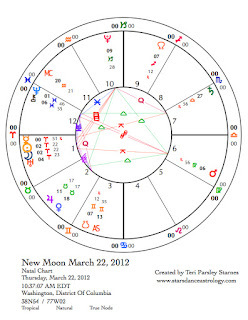 The New Moon chart presents a picture of volatility and a desire for great things. It may be hard to think small. The tense aspects of Sun, Moon, retrograde Mercury, and Uranus together near the beginning of impetuous Aries, square to Pluto in Capricorn (a sense of heavy responsibility) are pushing us toward change. In addition, Mars retrograding in Virgo is opposite Neptune and Chiron in Pisces. Oppositions invite integration. As we begin the 14-year adventure of Neptune in Pisces, Mars is reminding us to keep our feet on the ground, to be discerning, and to keep ourselves anchored to practical wisdom. These qualities will help us ascend to the transcendental heights that Neptune in Pisces promises. Three planets change direction this month. Stations of planets turning retrograde or direct are times when that planet’s strength is more noticeable. 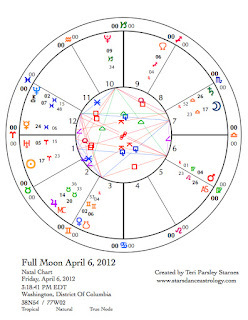 Mercury stations direct at 24° Pisces on April 4, right before the Full Moon of April 6. I expect that when Mercury reenters Aries on April 16, we will notice a shift in thought and communication patterns—more impatient, more augmentative, yet also more likely to try something new—to say, “Yes, and …” to intriguing possibilities. 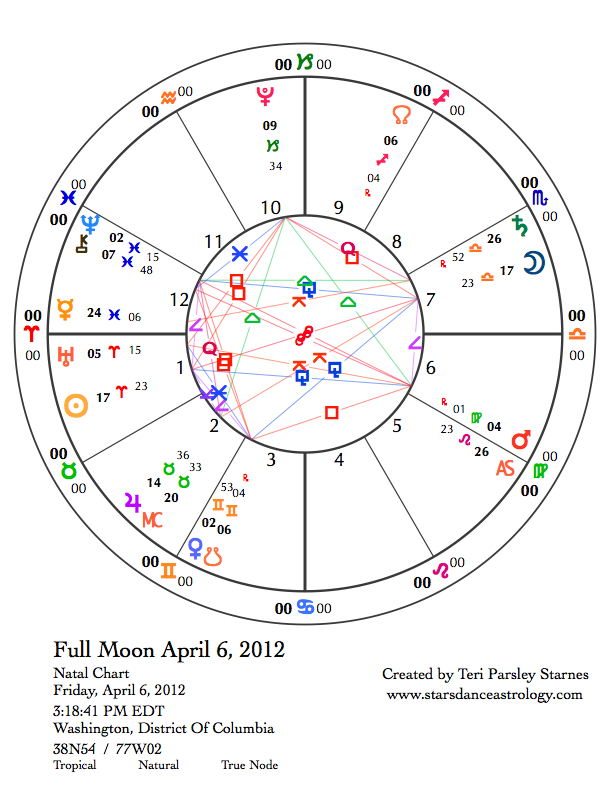 Pluto stations retrograde on April 10. Pluto began stationing retrograde each spring in 2003 and will continue that pattern until after 2050. In myth, Persephone returns from the underworld (Hades’/Pluto’s realm) at Vernal Equinox. Potent earth energy is released as the realm of the dead and the realm of the living exchange vital creative force. Pluto stations remind us of this power and this link between the worlds. Mars turns direct a few days later on April 13. I frame Mars retrogrades as the Hero’s Journey, which often take place in the underworld. Pay attention to what the underworld holds for you at this time. Women’s issues are in focus at the Full Moon. The chart shows extra stress on Venus through a t-square configuration [Venus in Gemini square to the opposition of Mars in Virgo and Neptune conjunct Chiron in Pisces]. Women’s issues, represented by Venus, are coming to the forefront in this election year. My sense is that women have not yet fully awakened to their anger; this full moon may represent a tipping point in that awakening. Venus enters Gemini on April 3 and spends more time than usual in this sign due to a retrograde cycle that begins May 15. Venus will not leave Gemini until August. In June, Venus will transit across the face of the Sun, a very special astronomical event that won’t happen again for 243 years. Gemini is about communication. Perhaps this transit is about making our voices heard around all the issues that Venus represents: women, wealth, love, beauty, values. Saying, “Yes, and ...” does not mean we become complacent. It doesn’t mean there isn’t a lot to disagree with or to be angry about. “Yes, and ...” is a strategy to bring about change by tapping into the inspiration that comes from collaboration. The kind of collaboration where no one quite knows the route we are taking, but we do know that we have all the tools we need to make it an exquisite journey.